OWINGS MILLS, Md. (AP) — During an NFL season in which wild, high-scoring games have become increasingly commonplace, one constant from the past remains unchanged: The Baltimore Ravens own the best defense in the league. 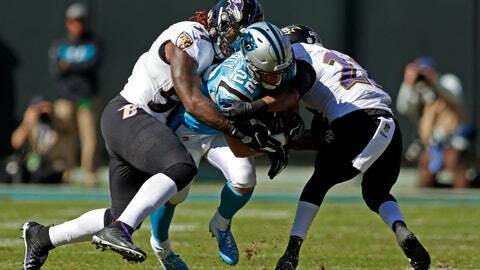 The Ravens rank first in the NFL in total defense (300 yards per game) and fewest points allowed (18.1). While these numbers don’t necessary stack up well against the 2000 team that surrendered only 247.9 yards and 10.3 points per game, the current unit can point to that 54-51 game between the Rams and Chiefs last Monday as proof that this year is unlike any other. Despite the play of the defense, Baltimore (5-5) is scrambling to end a three-year playoff drought. The Ravens limited Cincinnati to 255 yards last week in a 24-21 victory, and they’ll seek to build on that Sunday against the Oakland Raiders (2-8). “When those things start coming along, and if we continue to play at a high level in all the other areas, it’s got the making of being a special defense,” Weddle said. Baltimore’s defense works because first-year coordinator Don Martindale has been calling the right schemes for a unit that has strength on the line, in the middle and at the back end. Brandon Williams clogs the middle for linebackers C.J. Mosley and Terrell Suggs, and there’s depth at cornerback with Brandon Carr, Marlon Humphrey, Tavon Young and Jimmy Smith. That’s not been an issue for a defense that brought Lewis to his feet last week in the owner’s box.